Love this outfit, they "get it" in the internet age. Great pricing great product selection, great service. 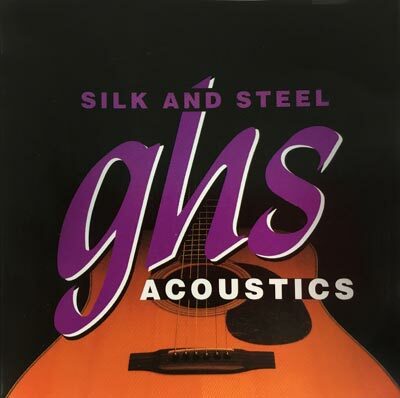 Tried these GHS Silk'n'steels in search of a mellower tone for my vintage maple-bodied grand auditorium size Guild flat-top. For about 5 minutes after initial installation I was afraid they just weren't putting enough tension to the top, sounded kind of muted and choked off, then after a few chords and a couple of songs they seemed to bloom, even tuned a full step down. Just what I was looking for, a less jangly tone that evoked the sounds of the '60's folk revival era. I have an Art&Lutherie parlor size guitar. I have had it for years and tried to sell it several times because I just did not like the sound. I have tried MANY string sets, including ball end nylon. I was about to tell my music store to sell it at WHATEVER price you can get. I decided to try 'silk 7 steel' because I had not used them before. VOILA! PERFECT! I am FINALLY enjoying my guitar. I play fingerstyle 'old blues' LUV 'EM! Ive been using a mahogany bodied resonator for most of my acoustic guitar work recently and was looking for strings that would enable me to get a less twangy sound from my instrument while still retaining some of the character of the instrument. These strings are absolutely perfect for this application., The silk cores removed the finger noise and warmed my instrument right up, but the silver coating still retains that sparkle though and really accentuates some of the brightness of my particular instrument. The tension of this string set is also much much lower than a normal set of acoustic strings. The lowered tension has enabled me to hold barre chords up and down the neck for an entire band practice without hand ache. This tension also makes my fingerpicking feel so good, I feel much more in control of the guitar and the strings. For a warm, almost classical guitar sound, these strings are really phenomenal. I would also recommend if you finger pick quite a bit and like warm fundamental with shimmering harmonics, the steel and silk strings are just the thing. GHS truly makes a great product and the cost is staggeringly low. Even if you don't like them, they're at least well made and inexpensive enough you wont feel so bad you don't like em. Try em out!